Our self retracting lifeline system's are recognised as the best, most durable and reliable of lifeline products available anywhere. Our SRL systems are backed by decades of proven field service in some of the most abusive environments known to man for absolute confidence and trust. These sealed SRL's incorporate a patented concept that separates all dynamic components, including the motor spring and brake, from foreign elements such as grease, moisture and dirt. You can always trust your SRL to work at peak efficiency without worrying about the environment you're working in. 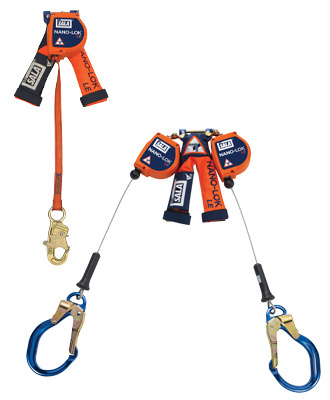 No other brand has the exclusive DBI-SALA® dual–mode descent/rescue operation! Our RSQ™ feature allows the user, prior to connection, to choose their mode of operation. This two-in-one operation lowers the cost of ownership by reducing the need for separate rescue equipment. Choose either the standard fall arrest mode, automatic descent mode or remote/assisted descent activation options for both fall arrest and rescue scenarios. SRL's extend and retract automatically, letting you comfortably move about at your normal speed within a recommended working area. Tension is always kept on the lifeline, which reduces dragging, snapping and trip falls.​​ Should a fall occur, a speed-sensing brake activates, stopping the fall and reducing the forces imposed on the user to safe levels. These SRL's are ideal for direct connection to most harnesses and because of their extremely compact size, they are virtually unnoticeable on your back. They stay out of the worker's way and can be easily used as a lanyard replacement. SRL's extend and retract automatically, letting you comfortably move about at your normal speed within a recommended working area. These SRL's are ideal for direct connection to most harnesses and because of their extremely compact size, they are virtually unnoticeable on your back. The system includes two SRL's providing 100% tie-off protection allowing the user to leap-frog from one location to another staying fully connected and protected. SRL's extend and retract automatically, letting you comfortably move about at your normal speed within a recommended working area. If your crew is working in saltwater or any moist or dirty location, you need a heavy-duty SRL that can stand up to these harsh environments. DBI-SALA™ offers you the most comprehensive line of sturdy, corrosion-resistant sealed SRLs in the industry—and decades of proven field experience. Our patented, Sealed SRLs keep foreign elements such as grease, moisture and dirt from entering, so your crew can always work with confidence—and at peak efficiency—no matter what their work environment may be. With a Rebel™ Self Retracting Lifeline (SRL), you get an economical fall protection solution that won't compromise the safety or performance of your crew. 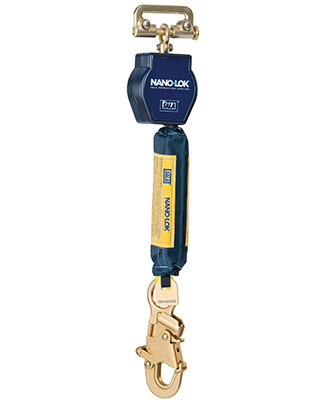 All lifelines in the Rebel series are compact and built to last, and meet or exceed all applicable industry standards. ​Rebel™ continues to set performance standards beyond compliance, while providing a substantial value compared to competitive models. Specifically designed for foot level tie-off and sharp edge applications! You live on the edge. We'll keep you safe! 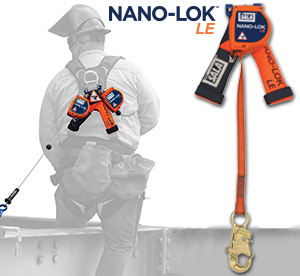 Capital Safety has revolutionised the Fall Protection industry again with the Nano-Lok™ LE Self Retracting Lifeline! It's specifically designed for foot level tie-off and sharp leading edge applications. This ground-breaking new product includes a 2.4m working length, is ergonomically designed for comfort, and is available in single and twin leg (100% tie-off) configurations in both webbing and cable models.